The complaint by indians that 'redskins' is offensive was ignored by Jack Kent Cooke and is being ignored by Dan Snyder. It is also ignored by the high-paid players and the fans, including blacks and Latinos. The name comes from the color of the scalps of indians sold by animal skin traders. Jack Kent Cooke always said he was complimenting indians by using the name. Susanne Harjo has always insisted otherwise. So we had mixed emotions when we heard that Zema "Chief Zee" Willians, right, was ailing with an aneurysm in his stomach. A blood clot in his left leg has also crippled the 65-year old retired used car salesman. 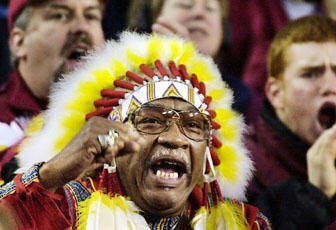 Chief Zee was inducted in 2000 into the special fans section of the NFL Hall of Fame as the Washington football team's No. 1 fan. He has not missed a home or away game in 30 years and he lives on a fixed income of $1,000 per month. His leg was broken by Philadelphia Eagles fans in 1983. We guess one person's pursuit of happiness can be insulting to another person.